T-bag hat, main shade 2 balls, contrast 1 ball. 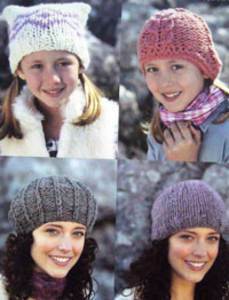 Pull-on hat: 4-6yrs 1 ball, 7yrs to adult, 2 balls. Tension 9st/ 12 rows to 10cm, 10mm needles. Also suitable for Sirdar Squiggle, Faroe, Big Softie (quantity may vary). 8 and 10mm needles; st holders and cable needle for helmet.